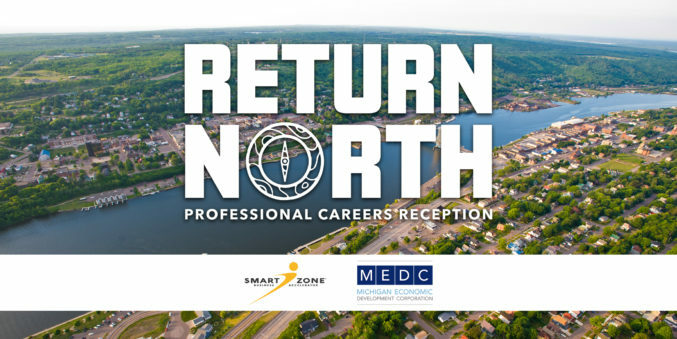 HOUGHTON, Mich. — (October 15, 2018) — MTEC SmartZone is gearing up to host Return North: Professional Careers Reception, its second annual Thanksgiving weekend event aimed at attracting professionals to the Keweenaw region. The event will be held on Friday, November 23 from 5-8 p.m. at the Bonfire Steakhouse in Houghton. Guests will have an opportunity to learn about local career opportunities in a casual networking setting while enjoying appetizers and refreshments. The Keweenaw is home to fast-growing, innovative companies that have produced hundreds of jobs and millions of dollars in revenue. With the hopes of convincing returning professionals that it’s time to ‘Return North’, about 20 local companies are coming together to showcase what they have to offer. ThermoAnalytics will have a wide-range of positions available including sales, finance, marketing, engineering, and software development. This event is free and open to the public. Attendees are encouraged to pre-register at www.return-north.com. The Return North event is sponsored by the Michigan Economic Development Corporation (MEDC) and hosted by MTEC SmartZone. MTEC, with the support of MEDC’s Entrepreneurship and Innovation (E&I) initiative has assisted companies in the region raise close to $50 million in funding and create 150 jobs. Michigan Tech Enterprise Corporation (MTEC) SmartZone is one of 20 SmartZone Incubators in the State of Michigan. As a 501(c)(3) non-profit organization directed by the Michigan Economic Development Corporation (MEDC), their mission is to accelerate high-tech businesses growth in the region. Since 2003, MTEC SmartZone has created over 800 high-tech jobs in the Houghton/Hancock area.